In this thread, I will document the fraud associated with the mediums Eusapia Palladino, Mina Crandon, Helen Duncan, and Mary Marshall Hall, these mediums used cheese-cloth, dolls, or cloth as "ectoplasm" or used other fake props, newspapers, tissue paper with cut outs of peoples heads and used other various tricks. Palladino was invited to England in July 1895 to Frederic William Henry Myers house in Cambridge for a series of investigations into her mediumship, according to reports by the investigators Myers and Oliver Lodge all the phenomena observed in the Cambridge sittings was the result of trickery. Her fraud was so clever according to Myers that it "must have needed long practice to bring it to its present level of skill. When she was brought in 1895 to London for investigation by the SPR (Society for Psychical Research), the results proved disastrous for her mediumship. During the London experiments Palladino was caught cheating in order to free herself from the physical controls of the experiments. Palladino was found liberating her hands by placing the hand of the controller on her left on top of the hand of the controller on her right. Instead of maintaining any contact with her, the observers on either side were found to be holding each other's hands and this made it possible for her to perform tricks. Richard Hodgson had observed Palladino free a hand to move objects and use her feet to kick pieces of furniture in the room. Because of the discovery of fraud, the British SPR investigators such as Henry Sidgwick and Frank Podmore considered Palladino's mediumship to be permanently discredited and because of her fraud she was banned from any further experiments with the SPR in Britain. According to the psychical researcher Harry Price who studied the mediumship of Palladino "Her tricks were usually childish: long hairs attached to small objects in order to produce 'telekinetic movements'; the gradual substitution of one hand for two when being controlled by sitters; the production of 'phenomena' with a foot which had been surreptitiously removed from its shoe and so on. In 1898 the French astronomers Camille Flammarion and Eugene Antoniadi investigated the mediumship of Palladino at the house of Flammarion and came to the conclusion that her performance was "fraud from beginning to end". Palladino tried constantly to free her hands from control and was caught lowering a letter-scale by means of a hair. 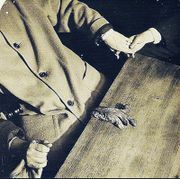 In a series of séances the physicist Jacques-Arsène d'Arsonval caught Palladino cheating many times. The professors Gustave Le Bon and Albert Dastre from Paris University examined Palladino in 1906 and came to the conclusion she was a cheat. They installed a secret lamp behind Palladino and in a séance saw her release her foot and use it In 1907 Palladino was found using a strand of her hair to move an object toward herself and it was noted by investigators that the objects were not outside of her easy reach. On 18 December 1909, in New York, the Harvard psychologist Hugo Munsterberg investigated Palladino's mediumship and, with the help of a hidden man lying under a table, caught her levitating the table with her foot. Some investigators were originally baffled how Palladino could move curtains from a distance when all the doors and windows in the séance room were closed, but it was later discovered that she moved the curtains by releasing a jet of air from a rubber bulb that she had in her hand. Palladino was known for using her sexual charms in attempts to seduce her scientific investigators, who were all male. She often slept with male sitters to whom she was attracted. Two investigators who had supported her mediumship, Charles Richet and Cesare Lombroso, were both known to have had a sexual relationship with Palladino. According to Deborah Blum, Palladino had a habit of “climbing into the laps of the male” investigators. Another investigator who had supported Palladino, Hereward Carrington, was known to have a had sexual relationship with another medium he investigated, Mina Crandon, so the same could have occurred with Palladino to bias his judgement in his reports of her mediumship. Crandon's "teleplasmic hand" that allegedly appeared in photographs was said to resemble sewn tracheae. Allegations were made by some conjuring historians of Houdini and medium-ship that her surgeon husband had altered her genitalia and this was where she concealed her teleplasmic hand. The "hand" did not move after its appearance on the table before her. It lay still as if it were dead and then supposedly vanished. She refused to wear tights, and refused to be internally searched, but no proof that Crandon had been surgically altered has ever been published. The 'hand' only appeared when Crandon sat next to her husband, who held or controlled her right hand. There are photos of the alleged teleplasmic hand and its position. It appears to be coming from Mina Crandon's groin. Various members of the audience in the séances had touched the hand and described it as dead. It was also suggested that Crandon's husband a surgeon may have got hold of it and sneaked it into the séance room. The "teleplasmic hand" was later exposed as a trick when biologists examined the hand and found it to be made of a piece of carved animal liver. Crandon's reputation was also damaged when a fingerprint left on wax ostensibly by her channelled spirit, her deceased brother, Walter, was discovered to belong to her dentist by a member of the Boston Society for Psychical Research. Her dentist divulged that he had taught her how to make these prints. Despite this, Crandon continued to perform until her early death in 1941, at about the age of 53. The above photo shows the carved piece of liver, as her fake ectoplasm hand. In 1931 the London Spiritualist Alliance examined Duncan's method. An early examination of pieces of Duncan's ectoplasm revealed it was made of cheese-cloth, paper mixed with the white of egg and lavatory paper stuck together. 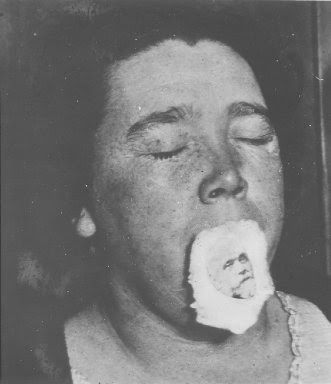 One of Duncan's tricks was to swallow and regurgitate some of her ectoplasm and she was persuaded to swallow a tablet of methylene blue before one of her séances by the London Spiritualist Alliance to rule out any chance of this trick being performed and because of this no ectoplasm appeared. Duncan also denied photos to be taken of in her séances but later accepted permission of photos but this backfired on her, as all flashlight photographs of her mediumship showed her to be using fake props in the séance room such as plastic dolls, cloth, rubber gloves and cut-out heads from magazine covers which she pretended to her audiences were spirits. In 1933 at a séance in Scotland a little girl called Peggy emerged in the séance room, someone grabbed her and the lights were turned on and the spirit was revealed to be Duncan. She was prosecuted and fined £10. In 1934, during a séance in Edinburgh, a sitter made a grab at one of her materialisations. The police were called, and the "spirit" was then alleged to be a stockinette undervest. Duncan was found guilty of affray and fake mediumship at Edinburgh Sheriff Court and sentenced to a £10 fine or one month in prison. Duncan's husband was also suspected as acting as her accomplice for hiding her cheesecloth ectoplasm. Harry Price (director of the National Laboratory of Psychical Research) was sceptical of Duncan and had her perform a number of test séances. 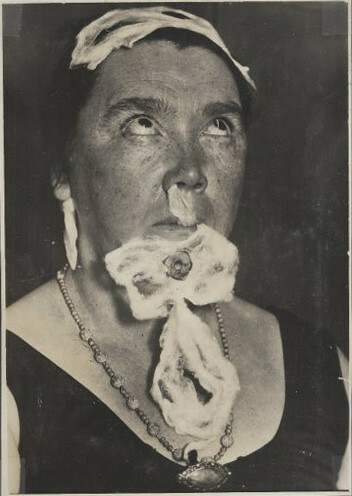 She was suspected of swallowing cheesecloth which was then regurgitated as "ectoplasm". She reacted violently at attempts to X-ray her, running from the laboratory and making a scene in the street, where her husband had to restrain her, destroying the controlled nature of the test. Following the report written by Price, Duncan's former maid Mary McGinlay confessed in detail to having aided Duncan in her mediumship tricks, and Duncan's husband admitted that the ectoplasm materialisations to be the result of regurgitation. Later Duncan was caught cheating again pretending to be a spirit in the séance room, this time Duncan and four of her traveling companions were prosecuted, convicted and sent to nine months in prison. Fake ectoplasm. Marshall with newspaper clippings of peoples heads and tissue paper. 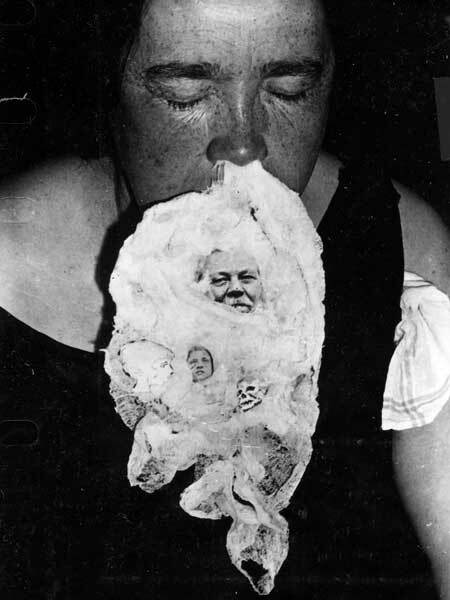 The photographs taken by Hamilton of ectoplasm reveal the substance to be made of tissue paper and magazine cut-outs of people. 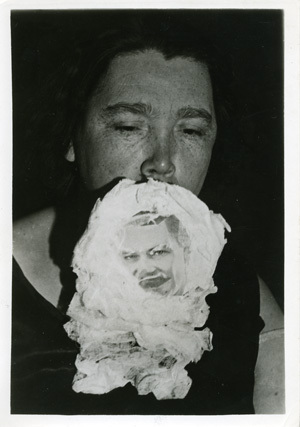 The famous photograph taken by Hamilton of the medium Mary Ann Marshall (1880-1963) depicts tissue paper with a cut out of Arthur Conan Doyle's head from a newspaper. Skeptics have suspected that Hamilton may have been behind the hoax. Ectoplasm has been proven to be based on fraud. Many mediums had used methods of swallowing and regurgitating textile products smoothed with potato starch and in other cases the ectoplasm was made of paper, cloth and egg white or butter muslin. 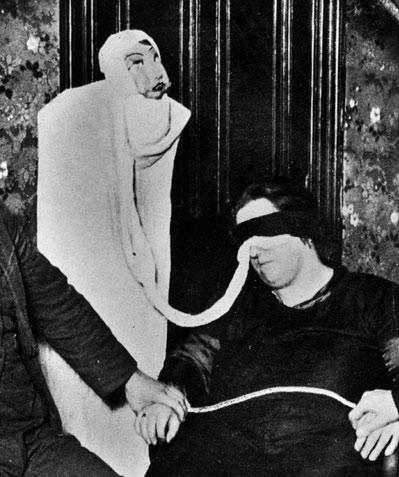 Because ectoplasm was believed susceptible to destruction by light, the possibility that ectoplasm might appear became a reason for making sure that Victorian séances took place in near darkness. 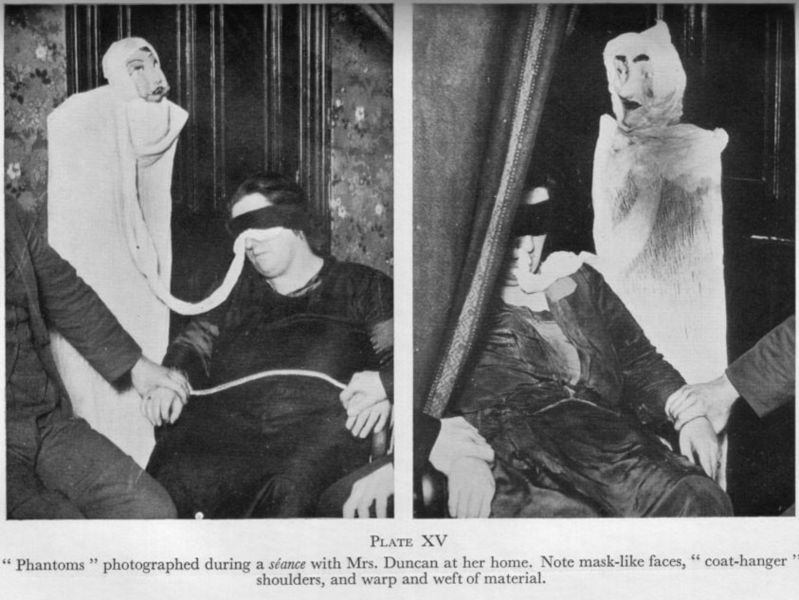 Poor lighting conditions also became an opportunity for fraud, particularly as faux ectoplasm was easy to make with a mixture of soap, gelatin and egg white, or perhaps merely well-placed muslin. Good post and a timely reminder that Spiritualism is but an extension of Natural Law and is best pondered, rather than observed. The benefits derive from identifying our spiritual essence, then awakening our inner selves, the Soul, and living in light of personal unfoldment. Phenomena of the kind described are not a part of this journey, merely a distraction from it. This, too will serve its purpose for those who are attracted to it. Fakery of one kind or another, is always among us and no doubt helps us in learning to assess and value the, usually visual, things of life. With the use of technology though, it now seems possible to create fakes of fakes. Evolution takes us along many twisting roads. All very interesting. I can only presume your experience of 'ectoplasmic phenomena' is very limited. Otherwise, while admiting that 'fraud' does occur, and has , unfortunately tainted the movement this is by no means always the case. In paricular 'Marjory' has been much maligned, and I suggest you read the full story. I have attended HUNDREDS of physical seances. I have both held and seen ectoplasm ( which was not cheese cloth or muslin ). I have spoken with and touched materialised spirit people, not once, but many times. I have had healing direct from a materialised spirit doctor while being aware that the medium was behind me and in deep trance, and being aware of where the other circle members were. I have experienced the materialisation of spirit children, when no children were present in the room at the start of the seance. I have witnessed a materialised dog greeting its owner and wagging its tail in the circle. I have seen self illuminated spirit lights showing me materialised hands and arms, and direct voice coming from different areas of the room and trumpet phenomena where I have seen ectoplasmic rods which are attached to them. Talk to me all you want to about frauds, because frauds exist; but do not please label all ectoplasmic phenomena as fraud. It just shows your ignorance. If you have experienced all the above, on multiple occasions, then then come to the same conclusion that it is all fraud, then that is your right; just as it is my right to be critical of some modern day 'physical mediums' who don't provide the goods. In paricular 'Marjory' has been much maligned, and I suggest you read the full story. I have read the full story. See the photos. And see the reports. Mina Crandon's "ectoplasm" hand was made of carved animal liver. There is no conspiracy. Scientists examined it. Crandon's reputation was also damaged when a fingerprint left on wax ostensibly by her channelled spirit, her deceased brother, Walter, was discovered to belong to her dentist by a member of the Boston Society for Psychical Research. Her dentist divulged that he had taught her how to make the prints. Fraud end of story. I have attended HUNDREDS of physical seances. It doesn't matter what you have attended mate, there is no scientific evidence that ectoplasm exists, it is all fake. If is was real, then we should be able to see it being performed in light conditions, not in dark rooms and we should have scientific evidence that it exists, but we are in the 21st century and the ectoplasm was a craze up until 1940's, when technology and cameras came in, and infrared apparatus and video cameras etc, reports of ectoplasm dropped. As for your other claims, spirit seances are known for hiding concealed people in the room, secret/trap doors etc and the rooms are never checked beforehand. As for your claim of materialised hands, they were dolls and other props like in the case of Helen Duncan. Here we go ... another expert. I agree Obi, Forrest the items you write about here come from which sources? There is a problem because committed sceptics, like Houdini and Harry Price, would go to any lengths to discredit a medium. Houdini would attack their character, if he could not do it any other way (there is good evidence he even tried to plant incriminating evidence to discredit Margery), Harry Price was caught cheating, to enhance his reputation and to discredit people on several occasions. Given your one sided approach, which shows a lack of detailed research of all elements of phenomena, I would like you to take time out to do some detailed research of all the old materials. Glendennig Hamilton was, in fact, a meticulous researcher and used Infra red cameras regularly. he also used banks of cameras, maybe you should read the books about his work. I also note that you do not touch on the mediums who Harry Price was impressed by Rudy Schneider and Eileen Garrett. There is no reference to the records of the SPR or full details of the Scientific Americans test with Margery. All in it is not a well researched piece, that would require far more detailed research. It is unfortunate that you place this as a factual truth on a Spiritualist forum without consideration of other issues. The very best researchers and many Spiritualists agree on one thing about Palladino she was capable of fraud deliberately but could also produce genuine mediumship. Plenty of evidential detailed research on this but you will have to go way beyond the internet into the Journals of the SPR and the work of the great researchers of the past. I think I have a much better handle on who was genuine and who was false and this forum is happy to write about these issues but would never use just one of either sceptical or spiritualist biased reports as a sole source of material. Given your one sided approach, which shows a lack of detailed research of all elements of phenomena, I would like you to take time out to do some detailed research of all the old materials. All of the stuff in my first post, came from the old materials. I used to be a spiritualist, and I am well read in many of the old books and reports for and against spiritualism. I also note that you do not touch on the mediums who Harry Price was impressed by Rudy Schneider and Eileen Garrett. It is a typical spiritualist mistake to claim that Price endorsed these mediums, but you are half right, back in the day he did at one point endorse both these mediums as genuine, but he later caught Schneider in an act of fraud, freeing his hand from a scientific control and wrote in a new report that Schneider was a fraud and as light of the new evidence, the older reports could not longer be taken seriously. Of course spiritualists tend to ignore this. The Schneider brothers were caught cheating by many other scientists, they would blow objects in the seance room. They were clever conjurers. The very best researchers and many Spiritualists agree on one thing about Palladino she was capable of fraud deliberately but could also produce genuine mediumship. This is not true, in the end Palladino only had 3 supporters but none of them supported the spiritualist hypothesis, so I never understand why spiritualists quote mine their works. Charles Richet (an opponent of the spiritualist hypothesis), and Cesare Lombroso were both having an affair and sexual relationship with Palladino, so their reports may well be biased, and as has been pointed out by other researchers, there were no scientific controls in their experiments as Palladino's feet were not held down or tied etc. Indeed the photos of claimed "levitation" of a table are bogus as not all four legs of the table are visible, also Palladino was a very clever conjurer (she was married to a magician), she knew how to levitate the table with her feet, and she was caught doing this many other times by other researchers, so there is no reason to assume she could really levitate tables. Dr. Stanley LeFevre Krebs wrote an entire book debunking Palladino and exposing the tricks that she had used throughout her career, Trick Methods of Eusapia Paladino published in 1910. You can read that free, it is available on the internet. Spiritualists choose to ignore it. In total Palladino was caught cheating by about 40 different scientists in many different countries, there is no conspiracy, they caught her cheating and that is the end of it, she was not a genuine medium. Even if this is true, it makes no difference. Crandon's ectoplasm hand was examined by scientists and was a piece of animal carved liver, this cannot be denied and even the photos reveal this. Mina Crandon would also have sexual relationships with those in the seance room, her husband a doctor even handed naked photos of her out to members of the audience. Crandon had an affair with one of her investigators Hereward Carrington. Interesting. What's your position on survival forests? obiwan wrote: Interesting. What's your position on survival forests? I believe in survival but am a strong critic of the spiritualist hypothesis. ""there is no scientific evidence that ectoplasm exists, it is all fake"..forests. All Mediumship should have its basis in Truth and be motivated by the desire to serve by trying to reveal that Life is deathless. Phenomena can be motivated by wishful thinking, fraud, and a desire for power. This must have occurred in Spiritualism, as it has in Christianity and no doubt other ways of thinking. Perhaps the RC insistence that a Priest has the ability to institute a change of a wafer into the living flesh and blood of someone who allegedly walked on Earth some time in the past could be scientifically examined? It would be a simple matter to apply DNA technology to establish the veracity of this belief, but somehow there is no appetite to do so, either for or against. Indeed, all the celebrants of Mass would logically produce the same DNA result each and every time, would they not? Or, are such attempts to use supposed phenomena merely performed to catch the gullible? We might then wonder just why. I also doubt the claimed reasons that those in the higher spheres would take any part in general group séances as it seems an interference in our evolutionary development, which in turn appears to be detrimental to their own position. Hence the trickery to lend authenticity to the event. Life is an individual road although 'when the pupil is ready' guidance can appear. The problem is from my studies I do not see any basis for truth in spiritualism. You sit down and start looking at the data objectively and every medium turns out to be involved with some kind of fraud, or could be explained by psychological factors. The older mediums used to use fake ectoplasm, dolls, cheese-cloth, cloth or muslin etc and the new mediums just perform cold reading, hypnotism or cheat and look into records etc of their audience. I see nothing of value in spiritualism but dishonesty. One of the users above said he has shaken hands with spirits, and met spirit people etc. Such a thing would be fascinating, but we have no video tapes of this, it is never performed in scientific conditions and never in the light, it is very easy to suspect trickery. Ok thanks I understand now. Though for different reasons, I agree with you. If every medium examined has been caught in fraud, as you state, why do you believe in survival? I agree entirely, forests. But these frauds usually attach themselves to 'physical phenomena' whereas the larger part of Mediumship is of the less spectacular Mental variety. In this, individual 'deceased' folk try - usually successfully - to mentally link with a suitable instrument to convey whatever information they wish to convey to their recipient, usually a loved one or close contact. The one - to - one connection can be outstandingly evidential, especially should they mention events that took place subsequent to their own passing, therefore rationally should have no knowledge of. There is also those who can receive unbidden personal info. The examination of 'evidence' is usually done via the intellectual mind, and why not, but if also examined via the intuitive mind much deeper things emerge. If also using the mediumistic senses - we all have them - simultaneously, then a living picture emerges. But, it is for the individual to decide for themselves whether they choose to keep the matter open or decide it is a lot of hooey. At the very least, Spiritualism tries to offer evidence of what is claimed while others say that you 'must' believe their particular strand or you are doomed for ever. We either survive physical death or we do not. I've had overwhelming personal evidence that we do, which is not the end of the search, but just a beginning. hiorta wrote: I agree entirely, forests. But these frauds usually attach themselves to 'physical phenomena' whereas the larger part of Mediumship is of the less spectacular Mental variety. Good points Hiorta. It seems to me though that if Spiritualism simply stuck at evidence, it wouldn't be problem. To me it looks like a cross between a religion and a business. Hi Forrest my wife and I have these books scholarly works they may claim to be but they are riddled with factual errors, distortions and opinions. Not just our opinion but that of the many serious researchers we correspond with. I suppose I am lucky, we have a range of people who are serious researchers to talk to an ecollection of many thousands of books, historical magazines and newspapers of the day. I believe categorically that medium prove survival and that not all physical mediumship (mediumship being about survival not phenomena) is false. I do agree that there are examples of falseness and once séances are held in the dark the level of fraud rises to alarming levels. I also disagree with you about Palladino because of a key series of investigations that were made by a group of researchers. I will never accept the research of Harry Price because he was a person who was discredited by many of his peers. To often Price created his own facts to suit his purposes. There is always more than one side of the story and the research of Osty and Baron von Schrenck-Notzing into Schneider is also well worth looking at. Alternatively you can look at an extract of Harry Price's "Fifty Years of Psychical Research" (1939) here http://www.survivalafterdeath.info/articles/price/spiritualism.htm . However I have already stated my reservations about some of his work and the methods used. The problem is if the investigator is guilty of the same tricks he claims the mediums used is he really trustworthy, when his is evidence right and when is it wrong. It is also interesting to read the report from Price on Margery. Not as lurid as Forrest claims and the charges Forrest makes are not fully proven even Price sits more on the fence. Also non of the more lurid claims are picked up here although Price was around through the whole episode. The Margery mediumship is well worth detailed study given that it was accepted at first by the Scientific American and Houdini just kept up the attacks by whatever means he could find. This is also fascinating about her its in French and the automatic translation brings up much unintended humour. I could have doubts about this, you seem very educated about spiritualism but you seem to ignore any literature which is against spiritualism but you may well indeed of read those books if you have access to large wealth of literature, but I have doubts about this, becuase it is not possible to walk away being a believer in spiritualism if you have in actual fact read those books, seriously they are filled with solid evidence documenting the fraud and sexual practices of early spiritualism. But back to the point, yes they were written by scholars. Alex Owen for example is a Professor of History and Gender Studies of the University of Sussex. Anne D. Braude is a Senior Lecturer on American Religious History and Director of the Women's Studies in Religion Program at Harvard University. Marlene Tromp is Professor of English and Women's Studies and Director of the Division of Humanities, Arts, and Cultural Studies at Arizona State University. Molly McGarry is a Associate Professor of History College of Humanities, Arts, and Social Sciences History at the Univesity of California. All these authors are professors, with multiple degrees and have spent many years researching this subject. In response you just say their information is filled with errors and opinions. Sorry but I don't buy that. Their research is sound, these are people who have spent countless hours researching the topic from an objective view. You don't have to accept the words of Harry Price, but the photographs speak for themselves. The photographs of Helen Duncan for example taken at his lab reveal cheese-cloth, and regarding Rudi Schneider a photograph revealed that he had freed his hands from the scientific control. There is no conspiracy, the photographs are real and reliable evidence against such mediums. It would be dishonest to deny such photographs. This is the problem, you are ignoring works written by scholars, and in response are offering spiritualist websites run on blogspots, sorry but this is just personal opinion, these are not scientific reliable sources. I don't mind reading opinions but if we are dealing with such matters as this we need to look at the scientific reports. Of course spiritualist websites are going to conclude that all mediums were genuine. See my original post, Rudi was not caught cheating by just Price, he was investigated by other scientists and was caught in fraud. His brother Willi was also caught blowing objects in the seance. As I said they were clever conjurers. Back to the subject of Rudi, when all experiments failed to prove his mediumship, he quit mediumship and became an automechanic. There is also this piece extracted from "Is Survival a Fact?" by Margaret Lillian Hamilton (1969, Psychic Press). You are not thinking rationally mate. See the OP, the photos taken by Hamilton reveal tissue paper, you are not going to claim to me that you actually believe such photos are real spirits are you? Tissue paper, newspaper cut out in the middle. As I said, you have to look at this rationally. The photographs show tissue paper, and even if the photos were evidence for real spirits, then why would they be that small coming out of the mouth of a medium? Lol. It is just bonkers. Honestly don't believe in such sillyness mate, it ruins any shred of credibility that you may have, and people will just claim you are nuts. Please don't confuse me as a dogmatic skeptic or proponent of scientism, I even said on the previous page I believe in survival, but we just have to be honest and admit the truth. Those photos reveal tissue paper, there is no way round it. You know as a spiritualist, you should be angry that such people have actually ruined your movement in the past with such sillyness. To be honest with you, I am always going to believe in survival no matter the evidence lol. If we had a psychologist on board they would just say it is a case of wishful thinking but I guess the same could claimed for the spiritualists, who believe in the spiritualist hypothesis no matter what the evidence, the difference is, is that I am honest and claim just a belief, whilst the spiritualists claim their spirit hypothesis has been scientifically proven. There are certain "skeptics" that claim any form of afterlife is impossible, this is not a scientific attitude, if you read over my posts nowhere have I said mediumship or anything else is impossible, there is just not any evidence for it currently. Just becuase there is currently no scientific repeatable concrete evidence for an afterlife, does not mean it does not exist. Are there certain pieces of "evidence" that may point to an afterlife?. There may well be. I am skeptical about near death experiences, it makes you wonder if they are just hallucinations or fantasies resulting from neurological and psychological processes or if something else has really been going on. I tend to learn towards the former on that one. What interests me the most is apparitional experiences, I have had two experiences but I believe they were cases of hypnagogia. I need to do more research in this area. If the afterlife exists, then I believe it would exist not for just humans. How can we draw a line between what survives and what does not? How could there be such a line? Spiritualists never mention bacteria, insects or plant. One of my criticisms of spiritualism is that it is too anthropocentric.